Looking at the observations being reported to the AAVSO for N Sgr 2015 no.2 (000-BLP-536), this nova has continued to brighten to about 4.5v with no indication the maximum has been reached yet. According to available VSX data on all other novae that have been observed in Sgr since about 1898 (there are many) , our current bright example may end up breaking a maximum apparent magnitude record for novae in Sagittarius currently held by V1059 Sgr (Na1898, max 4.5:p) and V630 Sgr (Na1936, max 4.5p in the Downes Catalog and other VSX references). I'm not sure where the VSX magnitude 1.6 maximum quoted for V630 Sgr comes from. Perhaps someone knows. "I'm not sure where the VSX magnitude 1.6 maximum quoted for V630 Sgr comes from." Good question. It's from GCVS. But interestingly Downes, et. al. listed 4.5 p - 17.5 V mag range, while S.Gaposchkin, AJ 60, 454, 1955. published (4.0) as the brightest data. I think the V630 Sgr value probably comes from GCVS. Of the material I have to hand, Payne-Gaposchkin 'The Galactic Novae' p.6 lists it as max 4.3, Bode & Evans 'Classical Novae (2nd edition)' p.26 has it at 1.6. Seems probably that it is an error in GCVS. VSX record of V630 Sgr to be revised? Hm, maybe the VSX record of V630 Sgr needs to be revised. I have updated the maximum magnitude for V630 Sgr in VSX. Thanks for the notification. Note that this nova had a very slow rise to about V=4.3, then an equally slow decline to V=6. It is now brightening again, so please keep an eye on it. I have diffraction grating spectra on several nights from BSM South and BSM Berry that I hope to upload in a week or so. Arne, the spectral behaviour of this nova is very interesting. 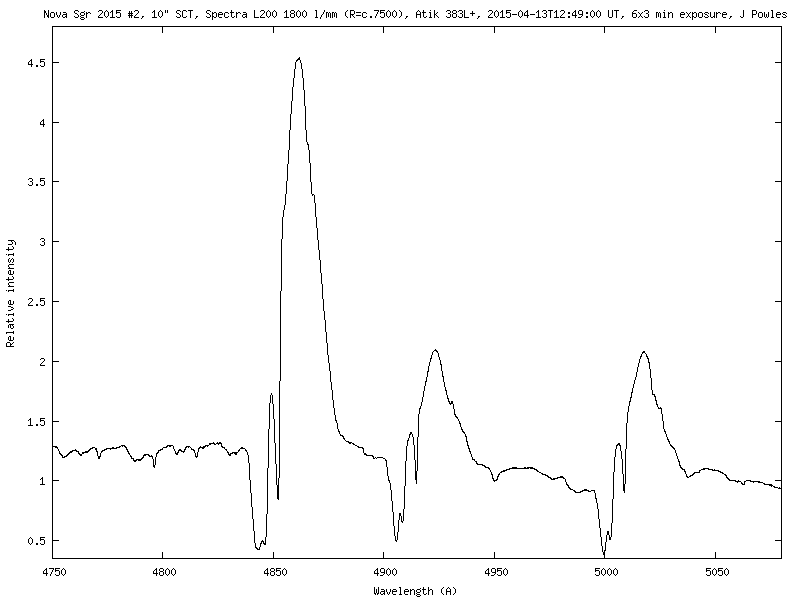 I'm taking regular low-resolution (R=700) spectra of the optical range 3800-8600 Ångstrom, and select higher-resolution spectra of the FeII region around 5000, the Na and He I lines at 5890 and 5876, and the OIL and CI lines at 7003 and 7115. There apwas a rapid spectral evolution around 22 March in which the emission lines vanished and the blue-shifted absorption components deepened dramatically. The emission profiles have since returned. I believe this is not unusual, and indicates the "fireball" stage of the nova (usually corresponding with optical maximum) was around this time. Now we have oscillations immediately after maximum. Nova Cen 2013 and Nova Sgr 2014 did the same. It would be extremely useful to have BVRI data on this nova during this period of oscillation. Is anyone doing regular photometry? Hi PJOC (and Arne). 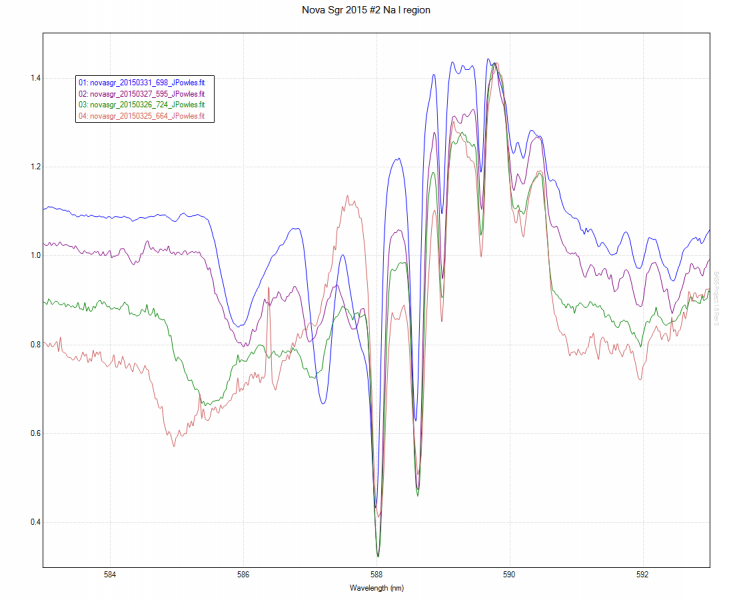 Thanks for the update of the interesting spectral behavior of N Sgr 2015 #2. The Fermi satellite detected gamma-rays starting on March 23 -- right after the interesting spectral changes you described! By the way, what is/was the velocity of the blue-shifted absorption you are seeing? And what can you say about the velocity of the material that is producing the emission lines? Since the gamma-rays must be related to the acceleration of particles to relativistic speeds in shocks, any constraints on the velocities of the various flows is very helpful. It would be fantastic if you could keep getting spectra of this target, since colleagues and I will observe it in the hard X-rays with the NuSTAR satellite in just about 2 days. My initial spectra from 2015-03-16 showed P Cygni profiles in the H beta line with velocities of c.2300 km/s, measured from the centre of the red peak (at rest velocity) to the blue wing of the absorption component. Similar velocities on 2015-03-22 in the H alpha and H beta lines (c. 2150 km/s). The width of the emission lines were c.600 km/s in each case. The picture is muich more complex since 2015-03-22. There are distinctly different velocities for different lines (e.g. 1800 km/s for H alpha on 2015-03-23, but 1100 km/s for the Na I 5890 line at the same time). I have yet to reduce the data, but I have spectra from the last three nights of the 5650-5950 region that show double P Cyg profiles - higher and lower velocity components for the same lines. I'll reduce the data and post spectra and velocities here. Low Resolution Spectra - any value to professionals? 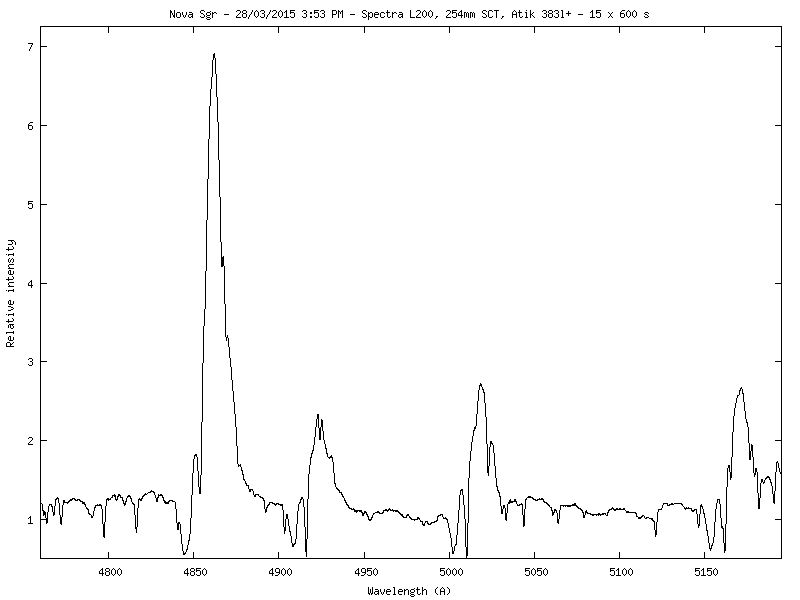 The attached file contains the low resolution (21 Angstrom/pixel) spectra of PNV ASAS J174600-2321.3 using the Star Analyzer SA-200 over the past 11 days. The spectral change is fascinating as an amateur. I'm still trying to sort through exactly what is happening during the supernova explosion. But are these spectra of any use to the professional community given the very low resolution? I'd like to get some BVRI (finally having all those filters) but I'm battling to get clear skies when the nova is visible. A personal request is that it would be good if photometrists get BVRI in tight temporal relationship instead of hours of B, then hours of V, then hours of R then hours of I. i.e. Take B, then V, then R, then I, submit that as a single group of 4 mags and repeat. This will allow the evolution of the B-V, V-R, R-I to be seen with better resolution. I found it easier to use Arne's BSM South data of V1369 Cen because I could directly relate the filter mags to one another and Arne's grouping of BVRI mags into groups made plotting those colour indices over time easy. Forecast is rubbish in my part of NZ so I will continue to cheer the efforts of Jonathan and Arne from the sidelines unless that improves. Nice work Jonathan! Here's some spectral profiles I obtained before, during and after (first?!) maximum showing the significant changes to the spectrum of this nova. Pre-maximum there were strong P Cygni profiles, around maximum the emission lines flattened and post maximum the emission lines returned but the P Cygni profiles had virtually disappeared. I have a backlog of spectra to process - three nights' of R=10,000 data around the Na I lines at 5890, and some low-resolution spectra from last week. But here is last night: 2.5 hours on the region to the red of H beta, including the Fe II lines at 4923, 5018, 5069. Interesting are the multiple P Cygni profiles. Each of the four lines shows two discrete blue-shifted absorption profiles - a higher-velocity one with maximum velocity of c.1350 km/s, and a lower-velocity one with maximum velocity of c.630 km/s. Even more interesting is what appears to be a red-shifted absorption component, c.480 km/s in recession superimposed on the emission component of each line. I have been able to get an spectrum of the nova last night remotely from Chile. Last time I took one it was in the night 21-22 March where no features wwere visible and I though here is a problem. Now nice feature (at low res) are visible (like in Gordons spectra). There is significant evolution over the week in the strength of the NII lines around 5676. 5676 itself remains strong, while the lines at 5666 and 5710 are prominent earlier but fade. There is a cluster of P Cyg and other absorption features associated with this region, some of which remain at a constant wavelength, some display decreasing velocity over the week. There is a similar pattern in a cluster of emission and blue-shifted absorption lines at 5785-5793-5801-5809. These are CI and/or FeII - I suspect both. There are prominent, defined P Cyg profiles at about -600 km/s, that don't seem to change velocity in the course of the week. This velocity is consistent with that observed in the FeII lines around 500 Angstroms. There are broader absorption lines further blueward, that appear to reduce in velocity in the course of the week from about -2200 km/s (25/3) to c. 1700 km/s. However, the situation in complicated here by the presence of HeI 5876 strongly in emission on 25/3, fading rapidly over the next few days. I suspect that what's actually happening is that the P Cyg absorption component from the He I is blending with that of Na I in thec earlier spectra. With so nice Spectrum of this Nova, did that helps to have a distance estimation ? RE:"With so nice Spectrum of this Nova, did that helps to have a distance estimation ?" Since this isn't at cosmological distances, Jonathan's measurements of the Nova's expansion velocity will not yield a distance; i.e. the Nova is a point source with no reference to the "depth" in space its located. If we assume is a classical nova that is has a peak absolute magnitude(Mabs) around -8.8 and there isn't any interstellar absorption, and its apparent magnitude(Mapp) at peak was +4.5, the distance should be: Distance(parcecs)=10 exp0.2*(Mapp-Mabs+5) = 4,571 parcecs or almost 15K light years! Can someone point me to one or more references for distance determination for novae other than this? Thank you James and David for those interesting info. After two weeks of cloud in Canberra I finally have got another spectrum of this nova. Triple P Cyg profiles now, at 1550, 975 and 740 km/s. Looking at the past week's reported brightness data for this nova in the LCG, given that its lastest decline is distinctly greater in its range than any previously exhibited oscillation, I strongly suspect that this decline heralds the onset of a D-class nova "dust dip" similar to that seen in conjunction with V705 Cas and DQ Her. If so, this would see Nova Sgr #2 fade dramatically over the next 6-8 weeks to a minimum of 10th to 14th magnitude, then to be followed by a 2-4 magnitude recovery. John, you were absolutely right about the impending (dust:) fade ... it appears to be underway in earnest, 8th mag in the visual/V and dropping judging by the recently submitted data. 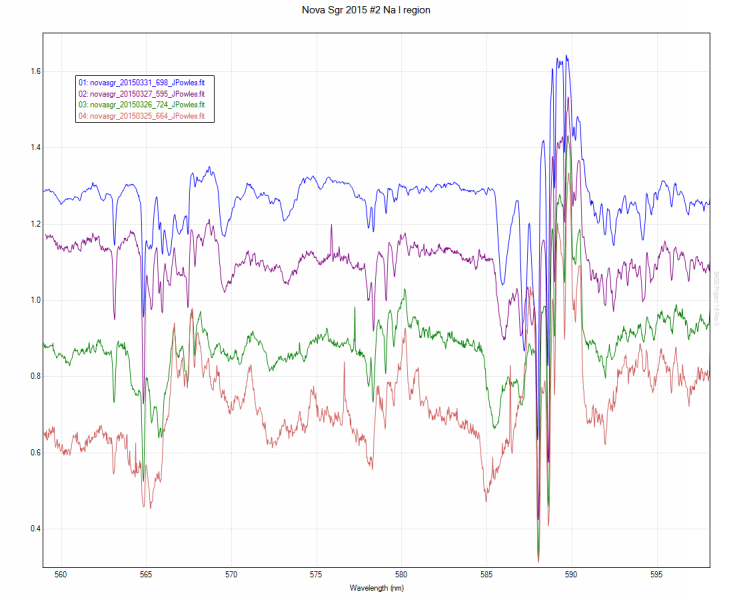 AAVSO Alert Notice 519 reports the fading of Nova Sgr 2015 No. 2 due to dust production and includes a current light curve. Please see the notice for info regarding requested coverage at this time.